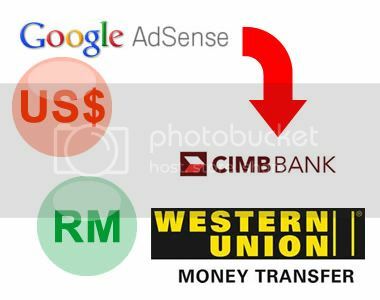 Besides, you also need to write down the amount of money to withdraw and sender address (mostly I will just write Google Inc) in the “To receive money” form (yellow color). The form can be obtained from the customer service counter. You can try to take as many as you can so that next time you can write down everything at home. Make sure that you need to bring along your identity card to CIMB when withdrawing; this is to recognize you as the account holder. They will photocopy it for their own reference. Sometimes, they may need your thumbprint as well. Now, Adsense is my main source of online income, it’s very easy to apply and make money from it. Although the amount that I earn not that much and it’s only 3-figure US dollar amount. But, I can do a lot of future plan with such amount of money. I will blog about this in the coming post. I would like to share with you my latest 2 months (April & May) Adsense earning here and it’s not fix income for every month. Sometimes you can earn more but sometimes less. Sometimes the USD exchange rate will go weaker against MYR, so you won’t earn much!!! You can try to see my comparison between months of April & May earnings…In April, USD drop and finally I withdraw it at the rate of 3.14 while in May, USD bounces back and I got it at the rate of 3.32. So, are you interested to earn extra income or not? I am planning to give a short course on how to make money from Google Adsense. Let your passion help you to set your goals and make our future brighter!!! This entry was posted on Saturday, June 12th, 2010 at 7:09 am	and is filed under Google, Internet Advertising, Make Money Online. You can follow any responses to this entry through the RSS 2.0 feed. You can leave a response, or trackback from your own site.